President Reuven Rivlin declares 'Jerusalem and Tel Aviv are here' at elementary school opening in Samarian community of Paduel. 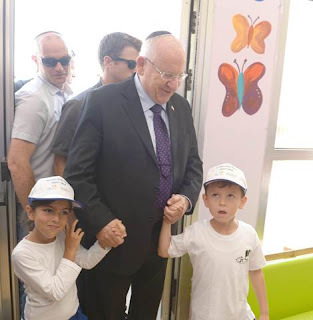 President Reuven Rivlin opened the start of the 2015-2016 school year on Tuesday at the elementary school in the Samarian community of Paduel. "Paduel is the symbol of connection - a link between the biblical [Israelite] kingdom and the state of today," Rivlin declared. "Samaria is here, Jerusalem is here and Tel Aviv is here." Rivlin appealed to the students and faculty of the school to remember that "just as in a place like this, where the roots of Judaism and Israeliness are tied together, so to from you can the educational infrastructure grow gloriously." 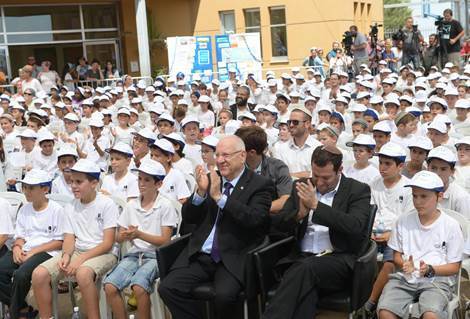 It is an "infrastructure that allows us to live together and build a better future," Rivlin added. Yossi Dagan, head of the Samaria Regional Council, also spoke at the ceremony, praising the growth of communities in the region. "With the new school year, we mark a huge increase in Samaria, six times the national average," Dagan noted.